Alan Tackett, Ph.D., will lead a center funded by a National Institutes of Health (NIH) grant of $11.5 million to the Arkansas Children’s Research Institute (ACRI). The Center for Translational Pediatric Research (CTPR) will result in new treatments and therapies developed specifically for children. The award is the largest-ever grant award that ACRI has received from NIH. July 12, 2017 | July 12, 2017 | The National Institutes of Health (NIH) has awarded $11.5 million to the Arkansas Children’s Research Institute (ACRI) to develop the Center for Translational Pediatric Research (CTPR). The award is the largest-ever grant award that ACRI has received from NIH. Under the direction of Alan Tackett, PhD, the center will result in new treatments and therapies developed specifically for children. “Historically, science has answered one question at a time,” Dr. Tackett said. 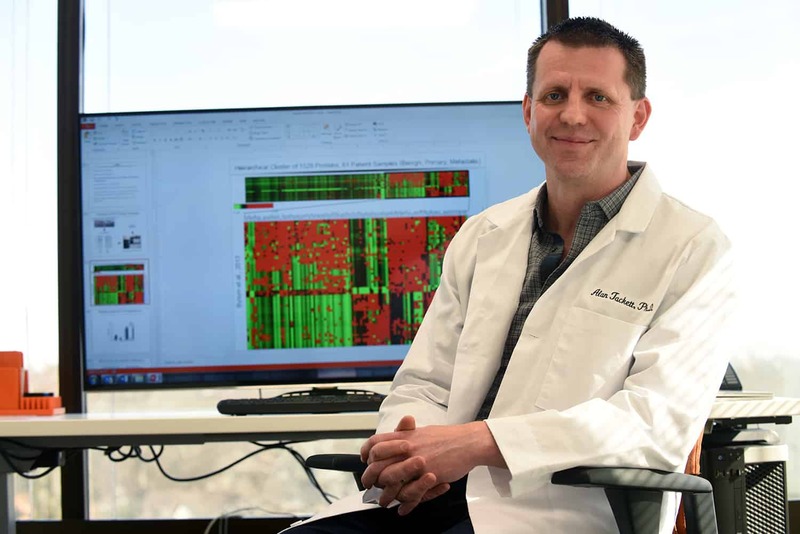 “By employing a more comprehensive systems biology approach, we can ask many questions at the same time, which allows us to more quickly understand the fundamental reasons that a disease is occurring and how to more specifically develop treatments. The NIH Institutional Development Award (IDeA) program will fund the CTPR as one of NIH’s prestigious Centers of Biological Research Excellence (COBRE). These grants create world-class research environments for young faculty who are identified as the next generation of excellence in research. The awards focus on building research in states that have historically had low levels of NIH funding. This first phase of COBRE funding will start in July of 2017 and last five years. A total of 15 years of funding is available through this federal program, and Tackett’s award is the second COBRE grant ACRI has received from NIH in the last year. ACRI is a free-standing state-of-the-art pediatric research center which provides a research environment on the ACH campus to foster research and scholarship of faculty members of University of Arkansas for Medical Sciences who are investigating questions relative to development, disease and treatment as it relates to the health of infants, children and adolescents. Physician and biomedical scientist investigators at ACRI and the Arkansas Children’s Nutrition Center (ACNC) conduct clinical, basic science, and health services research for the purpose of treating illnesses and preventing disease and thereby, improving the health of the children of Arkansas and beyond.